Want to watch Mad Men online with me? Join in! It’s Monday evening, I’m all suited up, sipping on an Old Fashioned and smoking a Lucky Strike. This can only mean one thing: I’m settling in to watch Mad Men online. This is definitely my favourite show of the current bunch of US TV dramas. AMC is knocking it out of the park these days. HBO? “HBwho” more like. AMC is definitely the future of classic US TV drama and if you don’t believe me then I implore you to stop what you’re doing, get home, get your laptop and watch Mad Men online. Why is this show so good? Like all the best shows it comes down to one main thing: the characters. The characters are intricately drawn, often flawed, morally ambiguous, very believable people, and week in, week out we see them fight for their dreams, collide with each others egos, and try to stake a claim in the highly competitive world of advertising in New York during the most transitional decade in modern history: the 60s. We have Don, the main focus of the show, a gifted advertising guru, Pete, the cocky young upstart, struggling to prove himself and be taken as seriously as Don, Peggy, the brave and quirky young woman striving to make her place in a man’s world, just a few of the many characters. There is also an incredible supporting cast, best of which is almost certainly Roger Sterling, one of two partners of the firm in which Mad Men is set. Roger is a drinker and a womaniser, seemingly happy to play the villain and the outcast (John Slattery is excellent in the role) who has a perhaps sexual, perhaps soulmate connection with Joan, the attractive, self-assured redhead who runs the secretaries (and so much more) in the offices of Sterling – Cooper. Particularly at the beginning of Season 1, the brutality of the patriarchal society makes for some uncomfortable viewing (which is so often the sign of important, powerful television). The sexism is writ large all over Mad Men, and it can take a while to get used to it, being so slyly satirised in the way that is it. Matthew Weiner respects his viewer and doesn’t try to tell them what to think or to force feed them little spoonfuls of morality. He simply presents things in a truthful manner; truthful in terms of the meticulously researched period detail, but truthful also in the depiction of human nature at its most casually cruel – the characters so often step on or over those who are socially below them. This is done without questioning, since it is just how society works at that time. The temptation is to shake our heads and wonder how a generation could have got it all so wrong – but Weiner doesn’t let us off so easily. Even the characters we are drawn to as the ‘heroes’ of the show display some despicable traits, that the viewer cannot help but reflect on such human behaviour and on whether we ourselves are guilty of similar in our own lives. It is not every TV drama that can elicit such probing questions from its viewers. Whilst this is all being played out on the big stage, we also get an insight into the drives, motivations, hopes and fears of the characters within themselves. Like any of us, the characters are trying to find happiness and a little meaning in their lives. This existential level to the show adds a real depth, especially in the main character Don Draper, who seems permanently numb to finding any lasting peace or happiness in his life, seemingly destined to be trapped in relationships in which he doesn’t feel what he is pretending to feel. The tension between the inner truth and the outer mask is paralleled in their weekly advertising campaigns. Don, Pete, Peggy and all the rest are living in a time of movement, and they themselves are never happy to keep still. A sense of dissatisfaction and discontent runs through the characters of Mad Men, with many living from project to project, or hoping that the next career change, relationship shift of promotion will bring that sense of satisfaction and peace we are all so clearly yearning for. Added to all this it’s fun, it’s funny, its filmed beautifully and everyone is dressed amazingly. It is definitely the most stylish show on TV, makes me think I seriously need to invest in a few more sharp suits and drink a few more fancy cocktails. 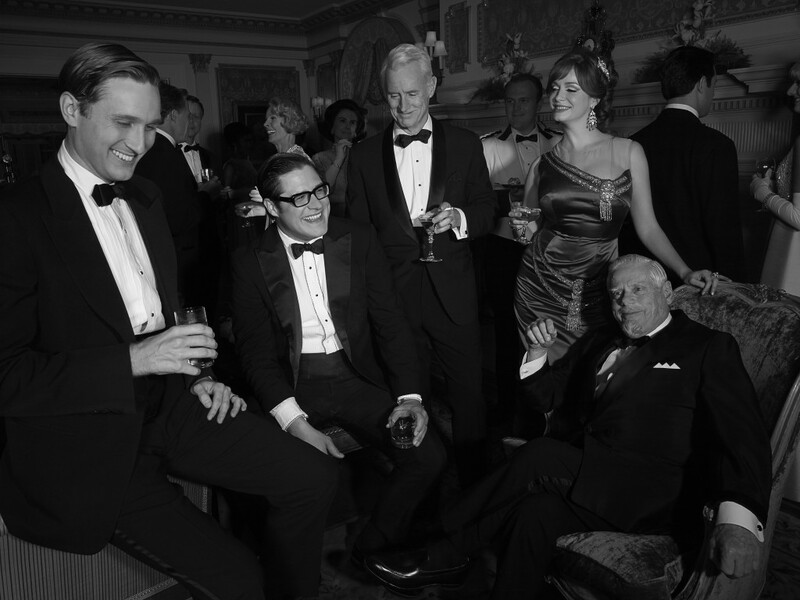 Check out our thoughts on Mad Men Fashion and Style! So if you don’t already, I strongly advise that you watch Mad Men online and then check back here every week. I’m going to be doing weekly Mad Men reviews of each episode, discussing themes, surprises, motifs and all the best moments. Get suited and booted, and please join me. If you are a subscriber of Xfinity or Optimum you can watch here. If you are a subscriber to Netflix, you can watch here. To download and watch the show, you can access Mad Men episodes through Amazon or iTunes. You may also be able to watch via Video On Demand from your local cable provider. I personally prefer to watch them online, rather than waiting a whole week for the next episode or buying the box sets on DVD. It is so much easier to watch Mad Men online, so much quicker and on-demand media providers (such as Netflix) often offer much better value for money. There are also a number of non-affiliated websites where you can watch Mad Men online, but you are strongly advised to investigate the legality of this before you decide whether it is worth streaming from these links for free. I also recommend paying a visit to AMC official Mad Men site for info, interest and discussion.